Location: Dominican Republic The mosquito is an insect with a great many miraculous features. 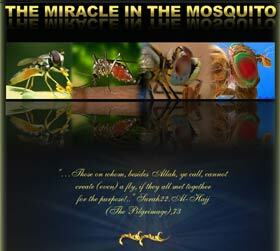 The characteristics it possesses, during its larval and pupal stages and as an adult clearly reveal that mosquitoes, like all other living things, are the work of a sublime Mind—in other words, of Almighty God. Fossil discoveries also clearly show that mosquitoes did not emerge as the result of any evolutionary process. They underwent no evolutionary changes. 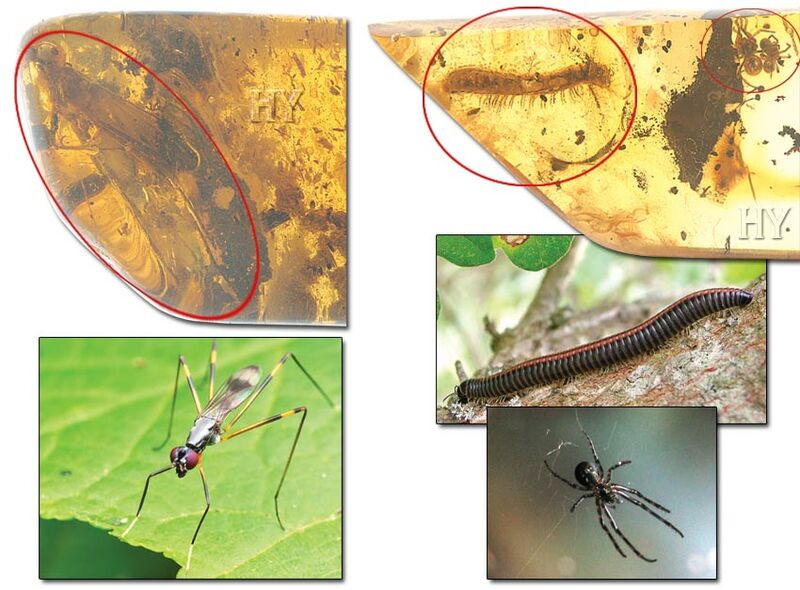 This mosquito preserved in amber seen in the picture is about 25 million years old, yet is identical to present-day mosquitoes. 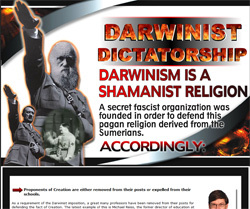 In the face of this complete absence of any change, Darwinists are condemned to silence. Black flies are members of the Simuliidae family. 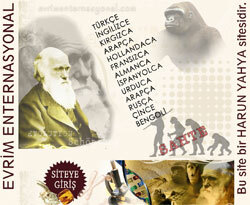 Some 1,800 species have been identified to date. These flies are generally grey or black in color and have short legs and antennae. Males generally feed on nectar, while the females also feed on the blood of other animals, just like mosquitoes. All the fossilized black fly that have come to light show that these insects have remained the same ever since they first came into being and have never changed—in other words, they have never evolved. 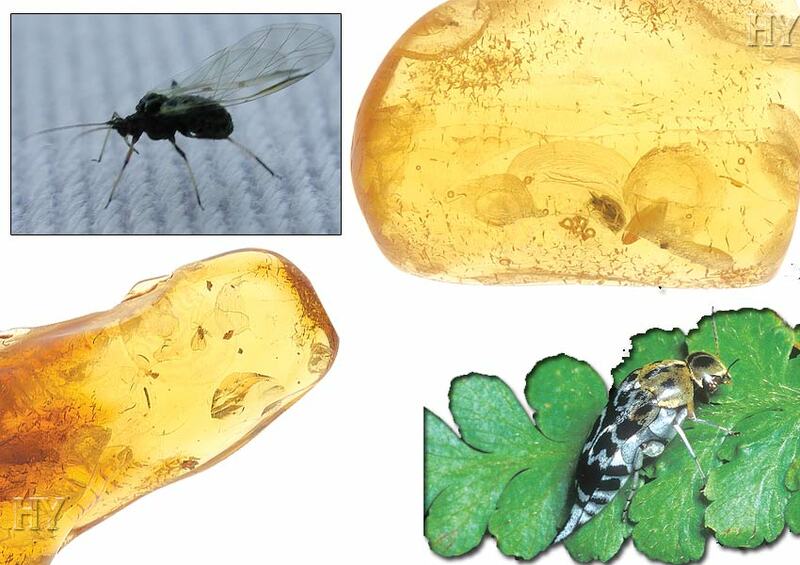 One such fossil is this 45-million-year-old black fly preserved in amber. These beetles of the Pedilidae family are also known as false ants. 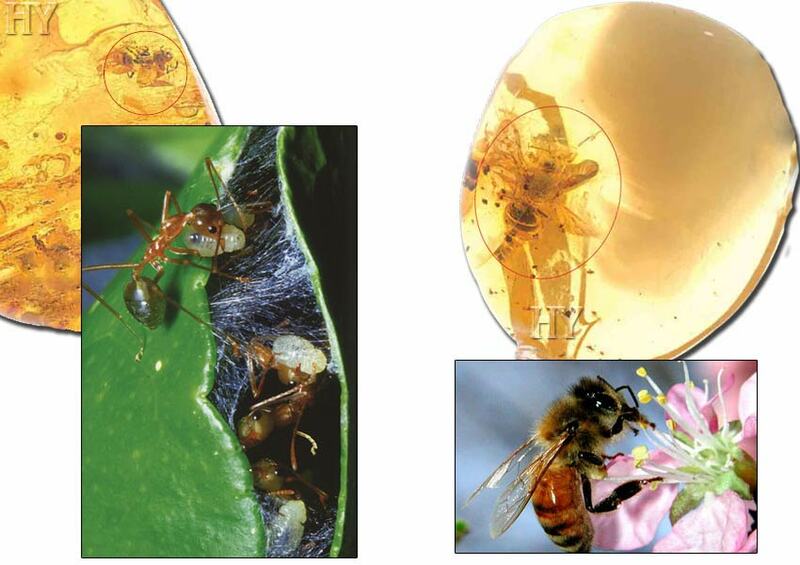 Adults live on flowers or greenery, where they feed on the plants' sap and nectar. The growing larvae live in rotting vegetation in moist environments. 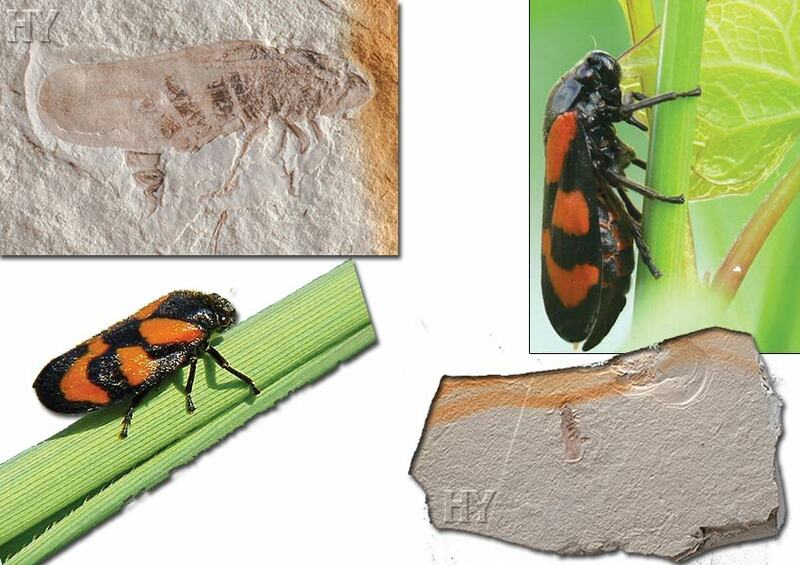 The fossil pictured shows that Pedilid beetles have remained unchanged for millions of years. Pedilid beetles, still identical to present-day specimens despite all the intervening years, tell us that the theory of evolution is a terrible deception. These flies, belonging to the family of Lauxaniidae, are known to have 1,500 species. They are approximately 5 millimeters (0.1 in) in length, and their wings are generally patterned. 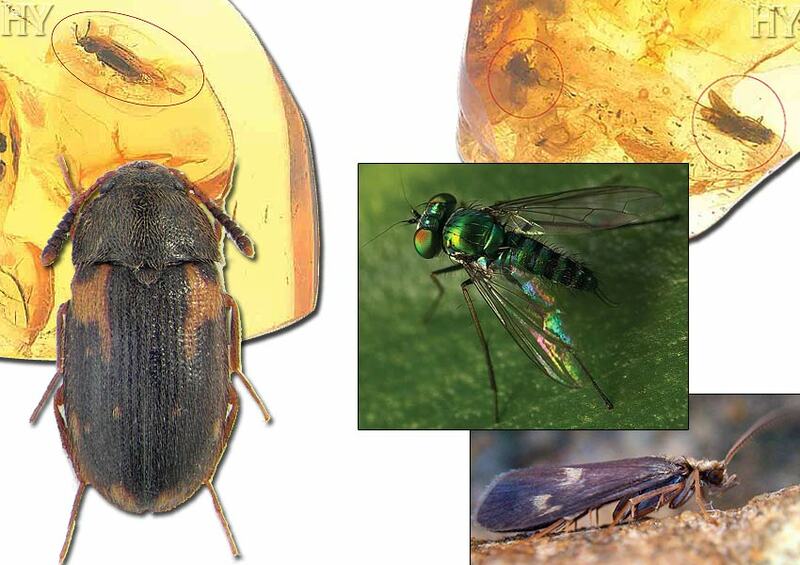 In this illustration, one midge was fossilized in amber beside two Lauxaniid flies. Darwinists hid and distorted most of the fossil record because they couldn't accept the fact these findings pointed out. Just like all other fossil discoveries made up until today, the fossils of Lauxaniid flies demonstrate the invalidity of evolution. Leaf beetles live in a great many regions around the world. They remain under stones or soil during winter and appear in spring. The leaf beetle illustrated is approximately 25 million years old. The fact that leaf beetles living today are exactly identical to those that lived 25 million years ago refutes the theory of evolution. Jumping ground bugs belong to the Dipsocoridae superfamily, usually live by the water and move very rapidly. Gall gnats cause the cells of plants' leaves and stems to grow faster, forming round, swollen gall. The gnats' larvae feed on these overgrown plant tissues. 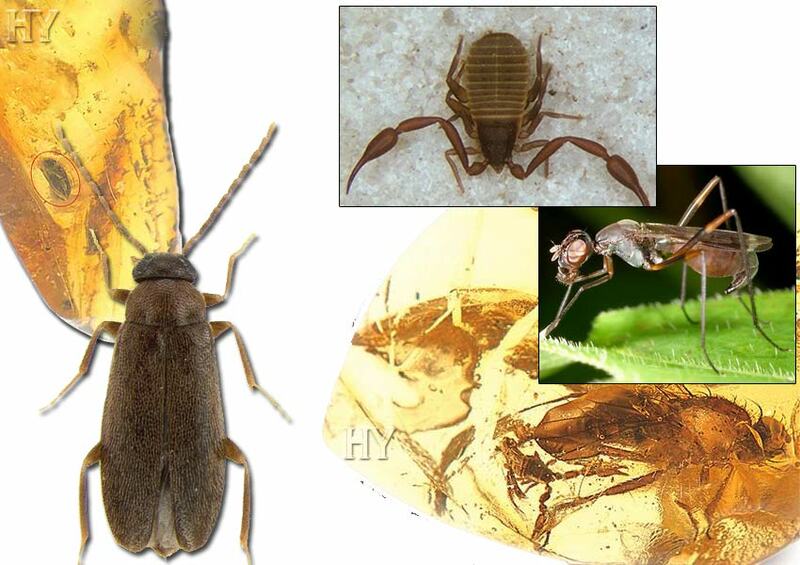 Specimens of both insects living today are the same as these examples that lived tens of millions of years ago. These insects, having stayed unchanged for tens of millions of years, demolish all the claims of Darwinists about the history of nature and betrays the fact that evolution never occurred. The tick fossil pictured is 25 million years old, but is no different from those living today. 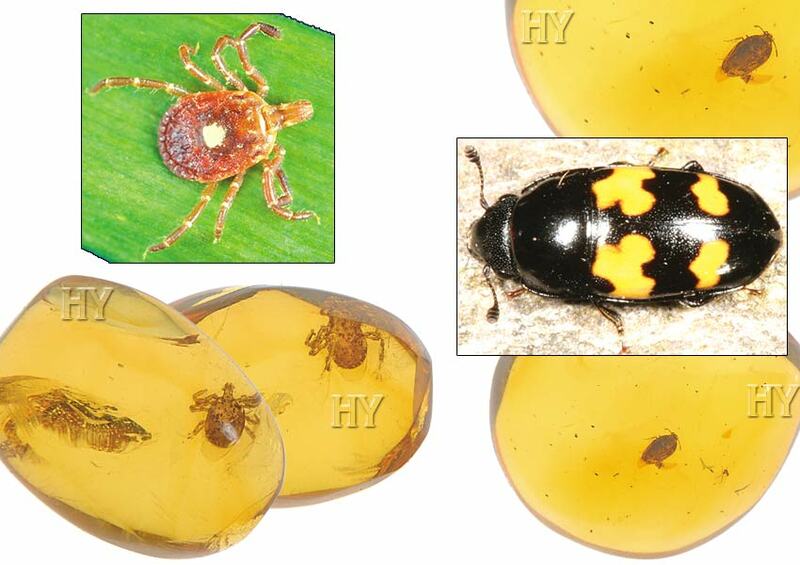 One of the most important living fossils, the ticks prove once again the Creation of God. 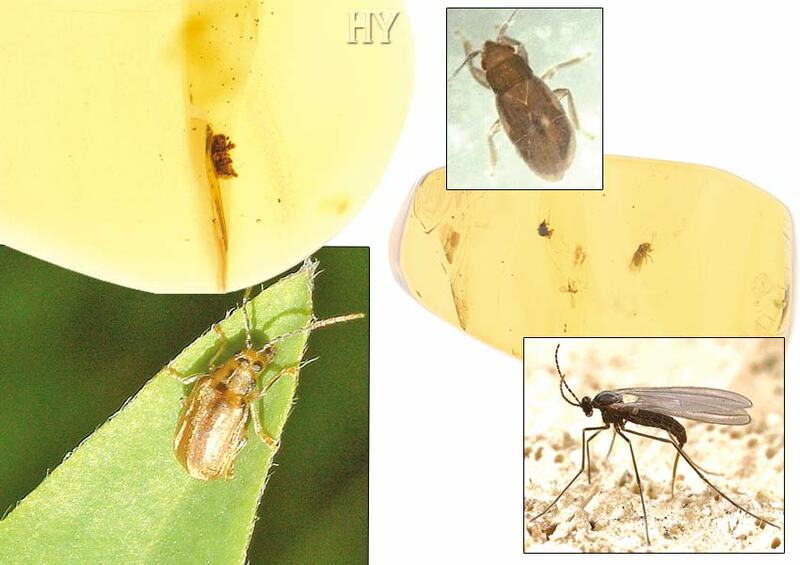 Belonging to the Nitidulidae family, sap beetles feed mostly on the fluids, pollen and fruits of damaged plants. They often damage fruits by digging themselves in beforehand. Like all species of beetles, the one pictured demonstrates that the theory of evolution is a fictitious scenario. These beetles, unchanged for 25 million years, show that living things never underwent evolution and that all creatures were created by God. Mayflies, which spend most of their lives as larvae, are sometimes called "one-day-flies" because they spend only one day at most, as adults during which time they mate and die. In the fossil record, they always appear with the same physiological features. These insects, which have remained unchanged for millions of years, affirm that Creation is a clear fact. Beetles in this order are distinguished by having up to 100 separate silk glands. Each one of them opens to the outside through a hollow hair. In this way, the spiders weave shelters in which they live. In temperate climates, they build their nests with denser silk tissues and retreat inside them during those times of the year when the weather is unsuitable.These beetles are generally found under tree bark, underneath stones and among rotting vegetation, where they construct a system of nests. All individuals in the colony can travel freely through the nests connected to one another with tube-like passages. Because of the delicate nature of these beetles' bodies and their webs, fossilized specimens are rarely encountered.These beetles, having remained the same for tens of millions of years, challenge the theory of evolution. These beetles, which move on water by straddling the surface and supported by surface tension, have thin, long forelegs and hind legs. Water striders, which belong to Gerridae family, continuously smear the hairs on their feet and so they can stand on water without sinking. 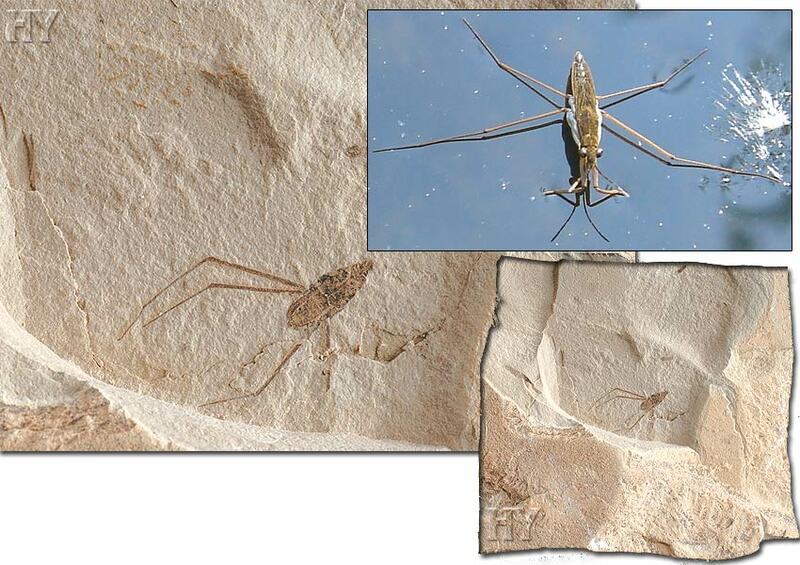 Those water striders that lived 54 to 37 million years ago were no different from those alive today. These beetles that have remained unchanged for tens of millions of years refute the Darwinists, who claim that the living species emerged through incremental changes. All living things were created by the Almighty God, Who created everything. 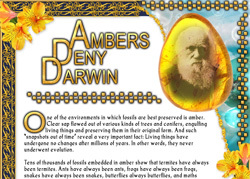 Darwinism thrives in an environment of ignorance, trying to create the belief that intermediate-form fossils exist although they don't, and continuously puts forward false proofs. 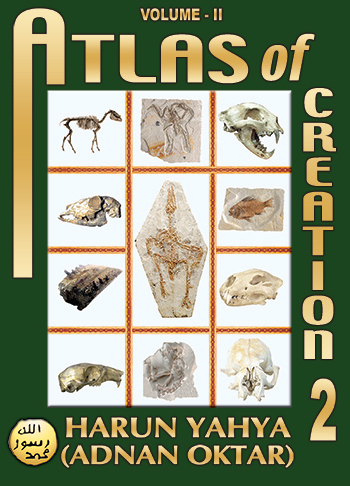 Authentic fossil evidence discovered all around the world points to only one explanation: the fact of Creation. 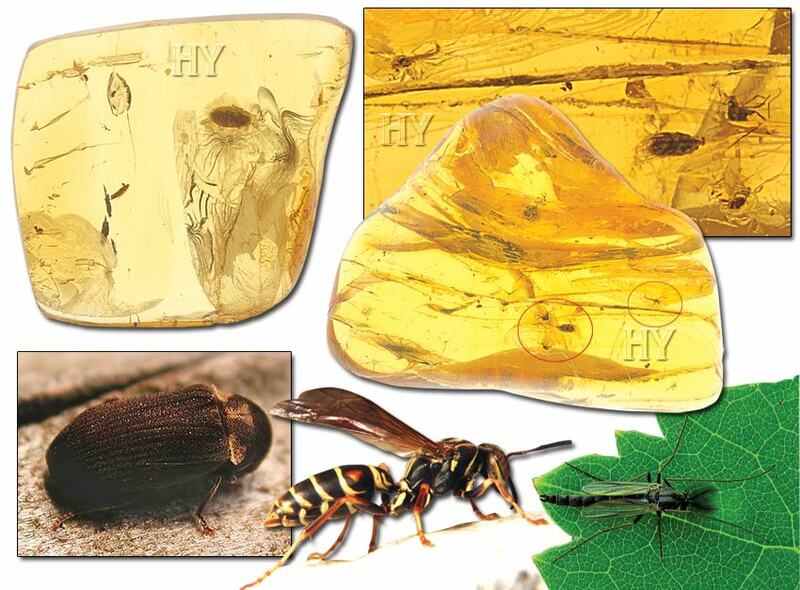 The wasp pictured belongs to the Eocene epoch, and by itself is just one of these pieces of evidence that invalidates evolution. Froghopper larvae produce a foamy substance on the stems of plants. Inside the foam, the larvae stand head down, feeding on the sap of the plant. Evolutionary theory cannot explain even one single chromosome possessed by this insect. Evolutionists claim that the cell was constituted through coincidences, but scientists cannot produce even one living cell using even the highest technological devices. Despite all these facts, the theory of evolution persists in the assertion that complex organisms came into being by chance. But the fossil record demonstrates that froghoppers existed 125 million years ago. 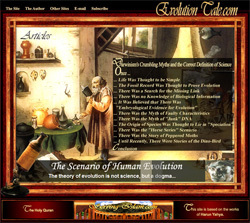 The story of gradual evolution has no evidence, and exists only in the minds of Darwinists. Thanks to the palpi on its colostrum, they are able to identify the property of the nutrients and one of these beetles' main characteristics is being able to live with the ants in peace. While the ants feed these beetles on purpose, the ant-loving beetles benefit the ants with the liquids they secrete from their bodies. The fossil pictured is evidence that these beetles haven't changed or undergone evolution for 25 million years. Thrips, of which there are more than 5,000 species, fall under the order of Thysanoptera. They have not undergone any change since the first day of their existence, and the fossil record is the most important proof of this. The fossil thrip pictured is 25 million years old, but is no different from those thrips living today, which emphasizes the invalidity of evolution and demonstrates that Creation is a clear fact. The flat-footed beetle illustrated is 25 million years old. These insects, which have undergone no changes over 25 million years, expose the claims of evolution about natural history to be falsehoods. The fact revealed by the fossil record is that God created these beetles, like all other creatures. Non-biting midges often fly in swarms that can be sometimes up to a few kilometers long. Occasionally, these swarms are so dense that other creatures find it impossible to penetrate them. Evolutionists are unable to maintain a reasonable, logical explanation for the fact that these non-biting midges that lived 40 million years ago are no different from those living today. Pictured are two non-biting midges fossilized beside a centipede. The oldest fossils of rove beetles, belonging to the family of Staphylinidae , are from the Triassic period (248 to 206 million years ago). 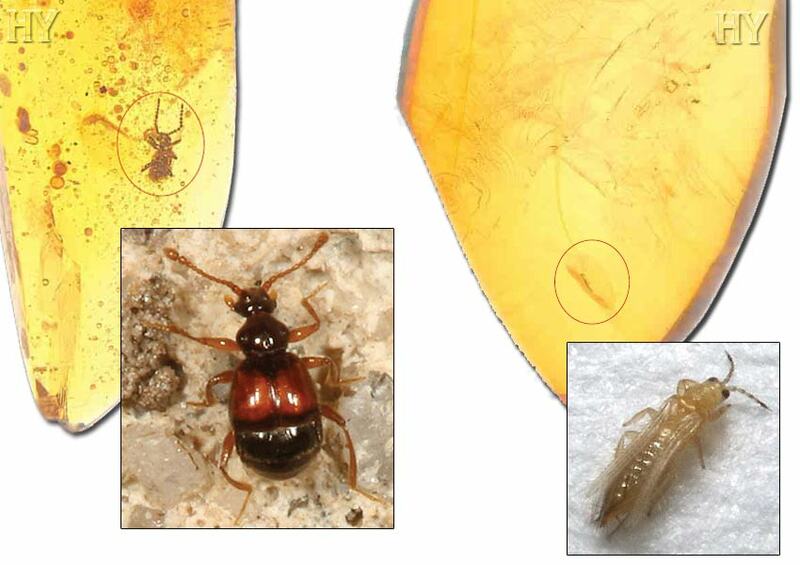 Two flies were fossilized beside this beetle in the amber. The rove beetles that lived 200 million years ago and those that lived 45 million years ago are no different from those that are still alive today. 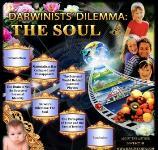 This situation, which proves that they never underwent evolution, also shows that Creation is a fact. These beetles, members of the Eucnemidae family, are mostly brown or black and inhabit forest areas. Fossils show that false click beetles have always existed as false click beetles, have never undergone any change and didn't evolve from any other insect. Despite the millions of years that have passed, false click beetles which have undergone no change refute the claims of evolutionists. These toe-winged beetles, which belong to the superfamily Byrroidea, live mostly in damp grass, along water fronts and in forests. They feed on weeds, and some plant species. Dark-winged fungus gnats, which belong to the Diptera order, have 1,700 as yet not formally defined species. 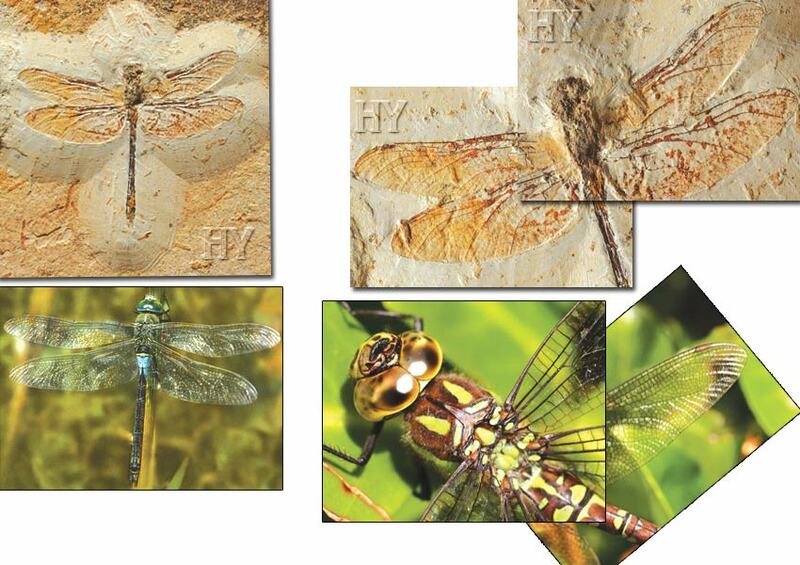 The fossils pictured show that both species of insect didn't change for tens of millions of years, in other words, they didn't evolve. These specimens, unchanged for 45 million years, invalidate the theory of evolution and confirm Creation. Having a good understanding of these insects' characteristics is important, for these living species, so very small in size, are often assumed to be simple creatures. 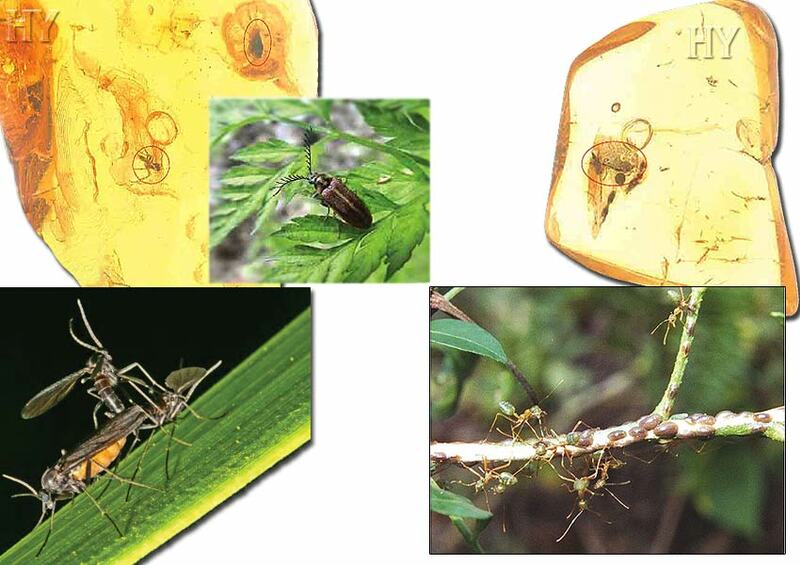 Scale insects are parasites that feed on the sap of plants. Roughly dome-shaped, they secrete a sticky, somewhat sweet liquid. There are over 7,000 species of scale insects, including the common soft scale, woolen scale, half-spherical scale and fig scale. These insects' reproductive system is remarkable. In May, a female scale starts to lay some 3,000 eggs under her shell, which is made up from a section of her back. Beneath this shell, the eggs continue their embryonic development. This way, the young larvae are protected. Within a short period of time, larvae with an oval structure emerge, moving freely and migrate to other sites along the plant. The advocates of evolution, which is merely a deception, benefit from people's lack of knowledge and avoid mentioning the highly complex features of living species like these. But scale insects' features such as their reproductive systems and the parasitic life they lead with plants are too complex to be explained away by the simplistic claims of the theory of evolution. 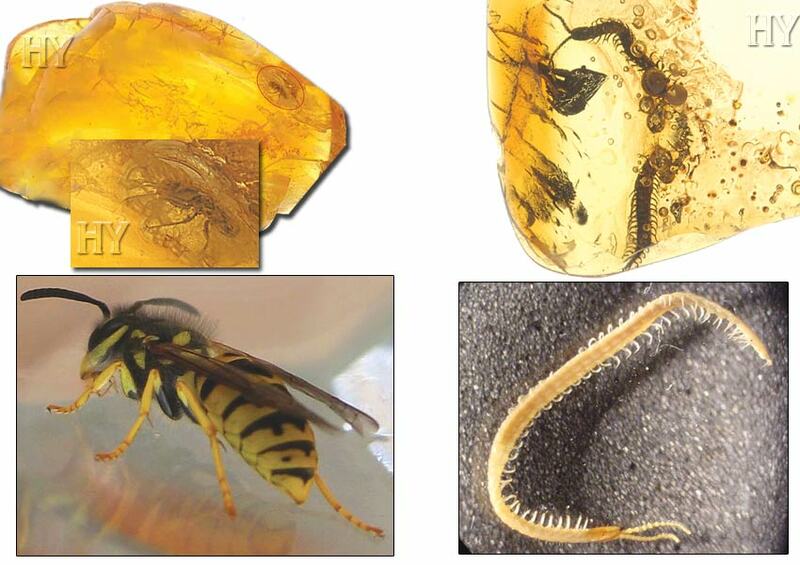 This 45-million-year-old species of wasp that has been preserved to this day in amber is a parasite. It has around 12,000 defined species and unidentified 40,000-50,000 species are estimated to be living around the world today. To lay eggs, these wasps select other species of insects and paralyze them. Then they deposit their eggs into this insect, providing a secure place for their larvae to grow. Some species sting their prey to death, while others make them sterile and slow down their movements, and thus make them secure places for the offspring to hatch and dine. 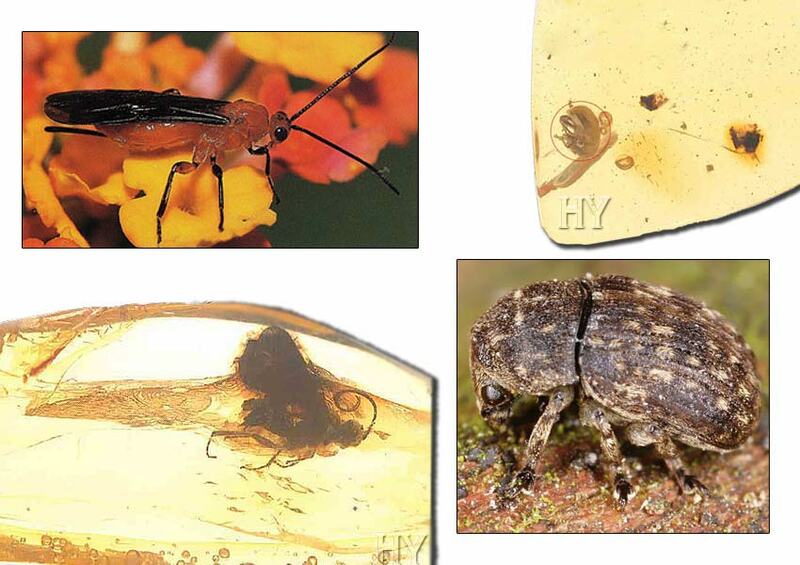 Evolutionists who define species that lived millions of years ago as "primitive" cannot explain the identical correspondence between these specimens preserved in amber with those alive today. The exact similarity between today's wasps and those specimens in the past is an obvious proof that these insects have never undergone evolution. Location: Baltic States, Jantarny, Russia False flower beetles, belonging to the Scarabaediae family, feed on the leaves of some plants. Fossil record shows that, like all other beetles, this species too had no change since it first appeared. These creatures have no intermediate form and are yet another one of the proofs of evolution's invalidity. 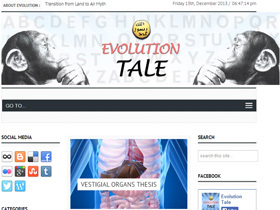 Evolutionists admit that no intermediate form was encountered in the fossil record. Pictured are a pseudoscorpion and a fly in Baltic amber. Pseudoscorpions resemble true scorpions, but they don't possess tails. On this specimen in amber, one can see these features clearly. Their length is between 2 and 8 millimeters (0.07 and 0.3 in). Until recently, pseudoscorpions were thought to date back only 30 to 45 million years, but now examples from 380 million years ago (of the Devonian period) have been discovered. Pseudoscorpions had no changes over an interval of some 400 million years, which refutes the theory of evolution. 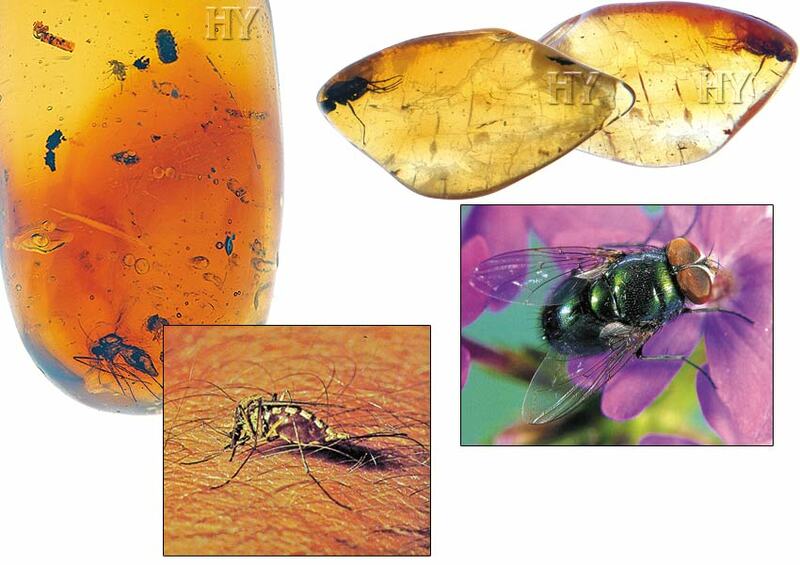 The accompanying fly in amber is another creature that sustains its existence and thus refutes Darwin. If evolution had indeed taken place, numerous examples of creatures that were in the "in between" stages of development should have been unearthed. Consequently, organs in their partly developed stages should exist in the fossil record. But among billions of fossils, not even one example displays any features to verify this claim. 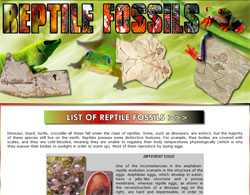 Moreover, still-living creatures are no different from their fossilized forms. This hairy fungus beetle 45 million years old is one of the examples that verifies this. 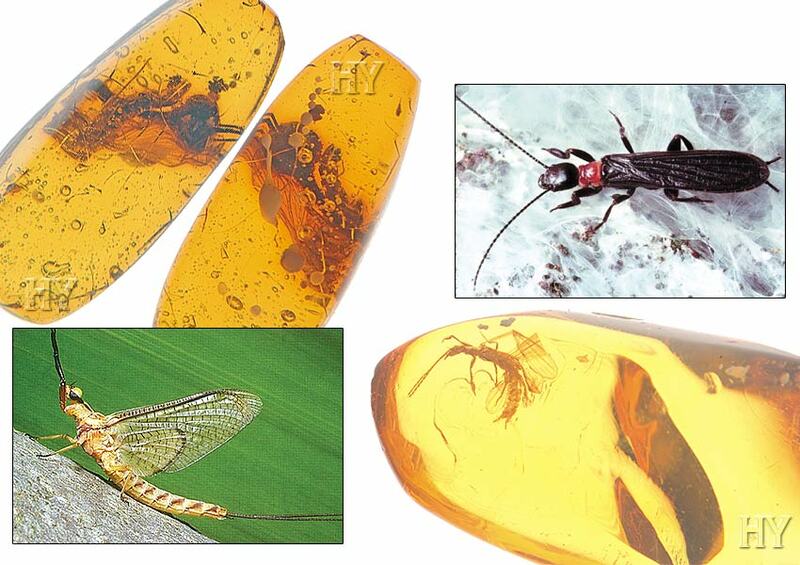 In this amber can be seen a long-legged fly and caddisfly, a moth-like creature. Larvae of the caddisfly live under water and make themselves cylindrical sheaths as armor to be protected against enemies, and possess the silk-producing system used solely for this purpose. Then they construct these sheaths with the objects they find in the river, such as sticks and pebbles. It is quite hard to recognize the caddisfly larva, once it has camouflaged itself perfectly in this interesting "dress." The larvae of these very insects have been protecting themselves from their enemies in this way for millions of years. This 45-million-year-old specimen in amber is proof that this creature never evolved in all the years since. Technology, cooperative work, military strategy, efficient communication networks, an ideal and rational hierarchy, discipline, immaculate city planning—in these fields where human beings are not always successful, ants always are. And they have been for tens of millions of years. Ants that lived 45 million years ago and those living today share the exact same characteristics. Snakeflies are mostly found on the shady parts of all kinds of trees, bushes and weeds, near forests. The larvae have adhesive organs on their feet that let them climb on even the smoothest surfaces. About 45 million years ago, this creature had the same superior features as those living today. 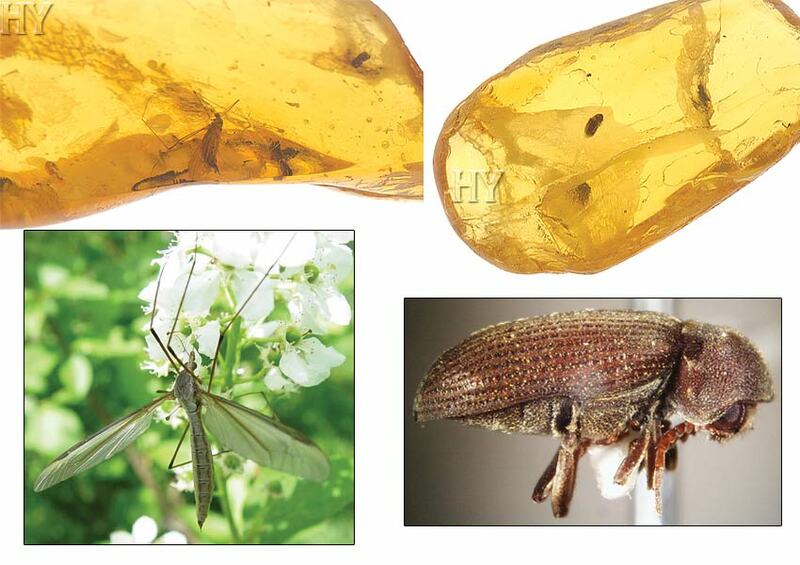 This insect was preserved in its every detail in amber, which survived up to the present day. Excellently well-preserved features of insects like this leave the evolutionists mute. Its structures, clear enough not to admit of any speculation, declare that no evolution took place during the intervening millions of years. Flower crickets are brightly colored and rounded, with large heads, short wings, and long antennas. They are around 2 centimeters (0.8 in) in length and in the daytime they hide in the holes that they have dug. Only the males produce sounds, to attract the females, by rubbing their wings against each other. 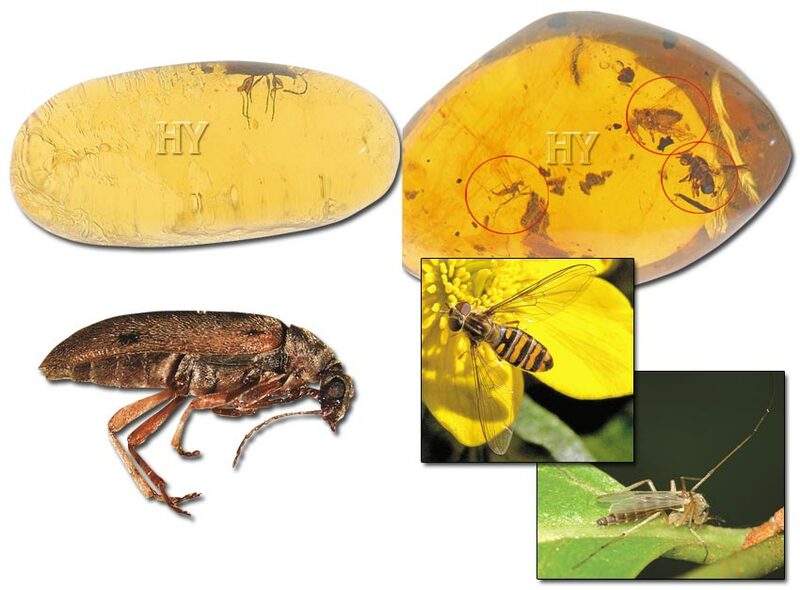 In the amber shown, you can see a flower cricket, which has been preserved without degradation for 45 million years. When we examine the recent examples of this insect, we see that they carry the same features since the day they were created. To put it another way, they never evolved. These are the words of Niles Eldredge, a paleontologist from the American Museum of Natural History and an advocate of punctuated equilibrium. He posited this thesis in the face of the desperate situation of the gradual evolution theory developed by Darwin's leadership. Eldredge manifests the fact that 45-million-year-old fossils like the stilt fly pictured here place evolutionists in a deadlock. 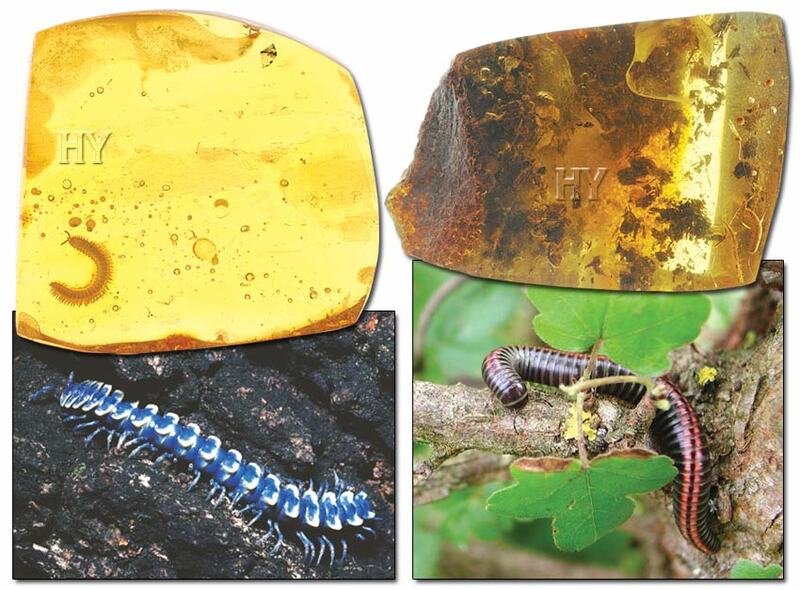 It can be seen that the 45-million-year-old millipede and two spiders in Baltic amber are no different from their counterparts alive today. Spiders of different species are able to set up various mechanical traps—underwater nests, lassos made out of web, chemical poison sprays, jumping from very high places by holding a string of web stronger than steel produced in their body, and camouflage. These arachnids can also make webs that are architectural and engineering wonders. Their bodies contain combs that work like a textile factory, labs producing chemicals, organs secreting very strong digestive secretions, sensors detecting the most sensitive vibrations, strong clamps that inject venom, and many other features evidencing Creation. When all these characteristics are considered, spiders alone are an important challenge to the theory of evolution and once again refute the Darwinists' claim of coincidence. Assassin bugs are predatory insects of the Reduviidea family. Some of the species in Central and South America are able to transmit to humans a fatal malady known as Chagas disease. It is this very insect that poisoned Darwin and caused him to spend the rest of his life in pain. This species uses its antenna to inject its poison and liquefies its victim's tissues. Its identical ancestors had the very same extraordinary defense system 25 million years ago. At that time, they employed the very same methods and led their lives in the very same way. The fossil record makes it clear that the insect of 25 million years ago was in no way primitive and that it displayed no differences from those alive today. This is yet another of the species that put Darwinism in an impasse. Living beings are extremely complex, having perfect features. Even a single little hair on a single insect has a function and is essential for its survival. The structures of all living beings have one element in common: irreducible complexity. Flawless systems that God created work as a living whole, in integrity. It is impossible to find features any more primitive in a 50-million-year-old tumbling flower beetle than in its counterpart alive today. Almighty God, the Creator of this beetle in its perfect form 50 million years ago, has the power to create it in the same way today. 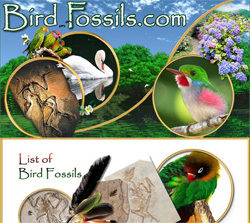 The fossil record continues to display this fact to Darwinists with new examples, constantly. A stick insect, one of the creatures that refute the Darwinist claims, possesses an elongated body. Its structure, appearance and features have not changed over 45 million years. These insects, which have remained the same for tens of millions of years, reveal the invalidity of the theory of evolution—which holds that living organisms develop through minor changes. The oldest known fossil millipede specimens are from the Devonian period (417 to 354 million years ago). With their structure having been unchanged over hundreds of millions of years, they are just another of the innumerable species that challenge the theory of evolution. This fossil millipede in amber is 45 million years old. The fact that millipedes of 300 million years ago, and those of 45 million years ago are all identical to living specimens has demolished all Darwinist claims with regard to the origin of life. This wasp is from the superfamily Chalcidoidea. In flight, these species are usually mistaken for mosquitoes or flies. Being quite small in size (1 to 20 millimeters, or 0.04 to -0.8 in), these wasps have maintained the same structure and features for tens of millions of years. Faced with these insects surviving for 45 million years without undergoing any changes at all, Darwinists should accept that their claims do not reflect the truth. 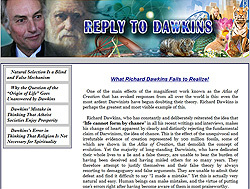 To date, Darwinists have not been able to put forward even a single fossil to back up their theories, for which reason they distort genuine fossils or produce falsified ones. On the other hand, they meticulously conceal from the public the millions of fossil specimens that refute their theory. However, the truth can no longer be concealed. Fossils give clear evidence that living creatures have not changed, nor evolved. One such piece of ancient evidence is this 45-million-year-old fossil centipede. Just as spiders have always existed as spiders and mosquitoes have always existed as mosquitoes, millipedes too have always existed as millipedes. The 45-million-year-old fossil millipede pictured confirms this fact. In the face of innumerable living fossil specimens, the theory of evolution is now due to be consigned to the dusty pages of history. This has been recognized and understood by masses of people. 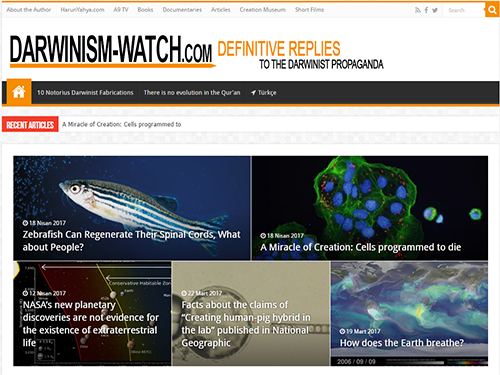 But for some ideological concerns, a handful of Darwinists close their eyes to facts. Millipedes appear in the fossil record suddenly and with their distinctive, peculiar structure. The oldest known millipedes (which are approximately 300 million years old) and present-day millipedes possess exactly the same anatomy. This identical structure puts evolutionists in a major deadlock. Furthermore, it applies not only to millipedes, but to all species. The conclusion is plain: Living beings did not undergo evolution, but were created by our Lord. 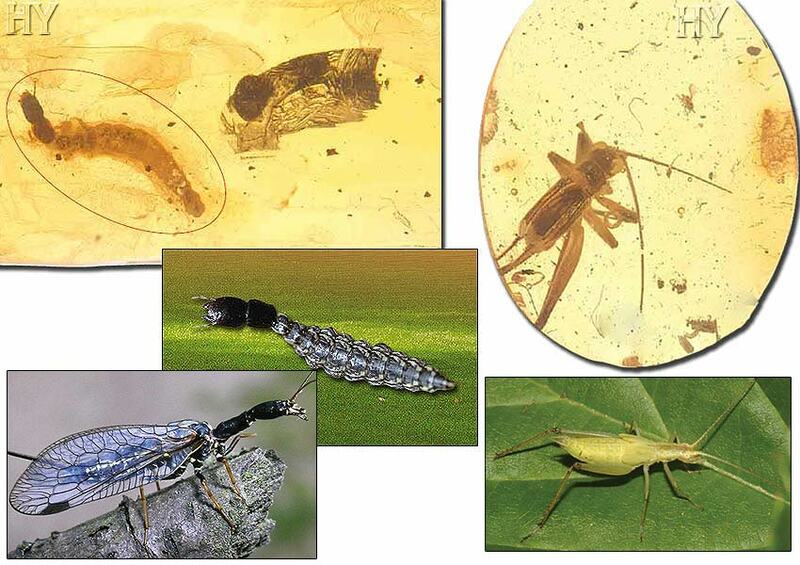 The oldest known plant louse fossils date back to the Carboniferous period (354 to 290 million years ago). 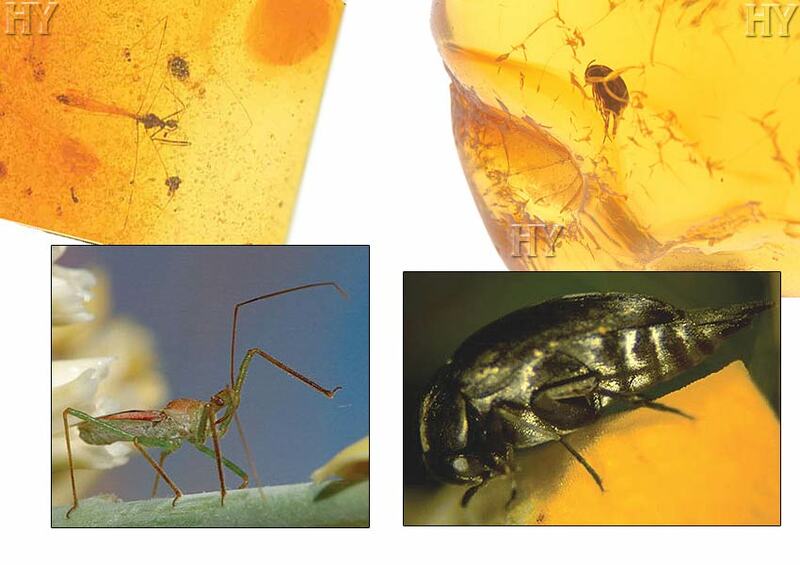 The winged plant louse trapped in amber in the picture is 45 million years old. Fossils like this one, which show that these animals have not altered at all since the moment they first came into being, are also proof that they never evolved. These insects live mainly in the tropic regions and are smaller than 1 centimeter (0.3 in) in size. The rear part of their abdomen is long and thorn-like in appearance. There is no difference between the 45-million-year-old fossil pictured and specimens living today. The fact revealed by a living insect that has remained unchanged for 45 million years is clear: Evolution is a process that exists only in Darwinists' imaginations. The reality is that evolution never happened. Living things are the work of our Omnipotent Lord, God. 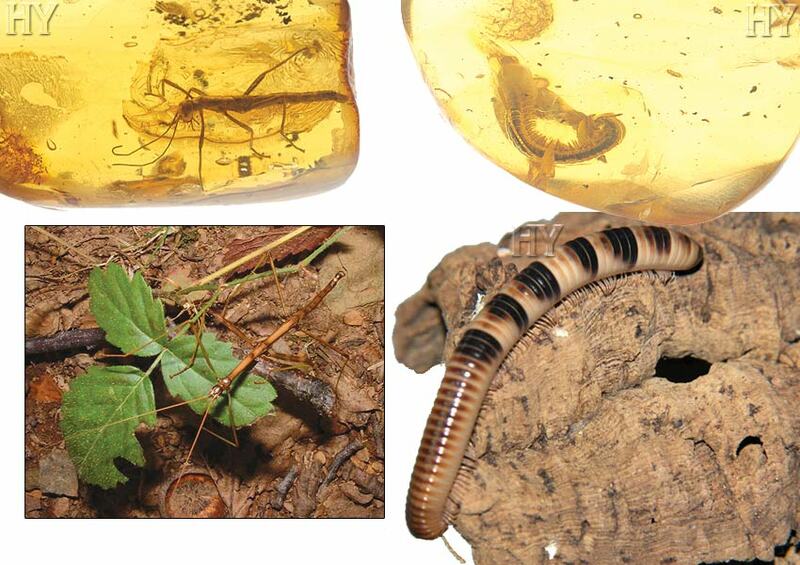 The centipede in this 45-million-year-old Baltic amber is completely identical to present-day specimens. The very oldest centipede fossils date back to the Devonian period, making them around 400 million years old. This shows that centipedes have existed over the last 400 million years, without undergoing evolution, with all the advanced systems they still possess. 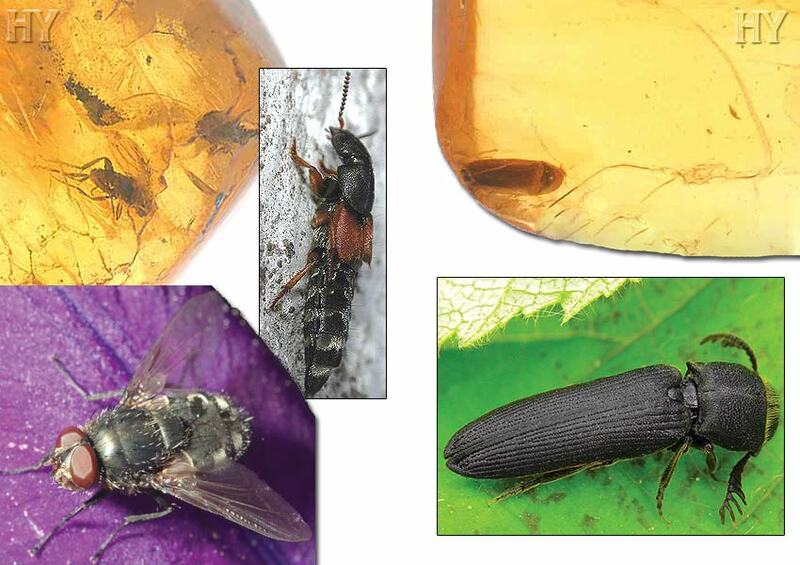 The amber pictured contains two different insects. The hairy fungus beetle is small, oval and covered in hair. It lives on fungi and is generally black or brown. The 45-million-year-old specimen inside this amber has the same features as present-day specimens. 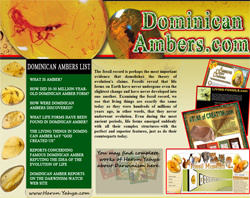 The long-legged fly beside it in the amber is an insect that has survived completely unaltered from the Cretaceous period— a period of more than 100 million years. This beetle is completely identical to modern-day specimens, and all by itself is sufficient to invalidate evolutionists' claims. 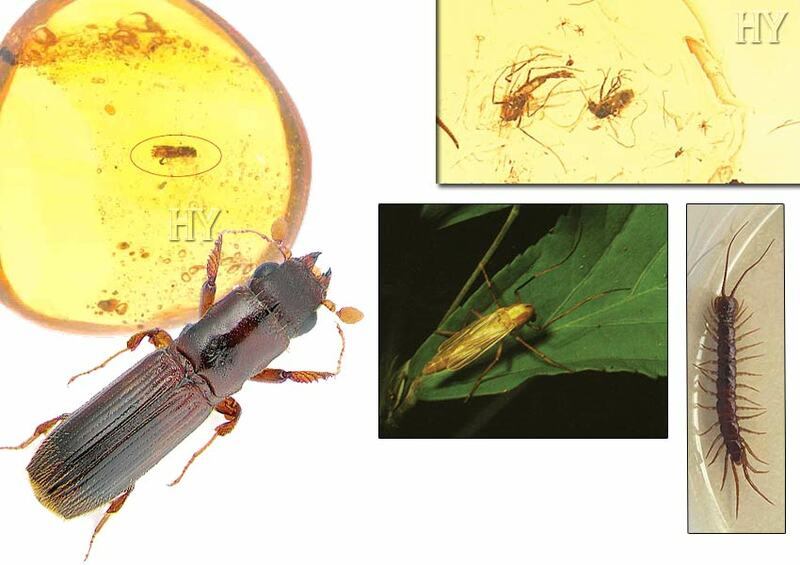 Like all other beetles, this deathwatch beetle preserved in amber that dates back to the Eocene epoch (54 to 37 million years ago) possesses very interesting characteristics. During their larval stage, deathwatch beetles store the nutrients they need as fat tissue and use them during their adult stage, not taking on any further nutrients from the outside. These insects, which live in wood, are able to digest cellulose with the help of bacteria and fungi in their stomachs. During the mating period, they knock on the tunnels they've dug in the wood, producing a noise that can easily be heard by human beings. Deathwatch beetles have had these fascinating characteristics for millions of years. Inside this 45-million-year-old amber, there are two different species. As can be seen in the picture, the three midges and one wasp have left their remains behind. According to the theory of evolution, these insects should have had primitive, deficient characteristics 45 million years ago, compared with their present-day counterparts. A very large number of changes in these creatures should be now visible, after the imaginary process of evolution lasting millions of years. However, there is not the slightest difference between the appearances of both midges and wasps as they were 45 million years ago and their "living fossil" counterparts today. 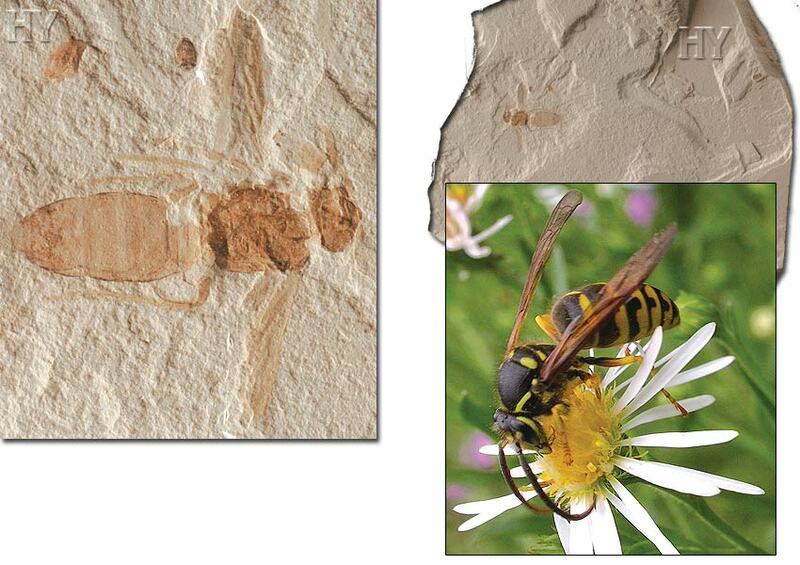 This wasp fossil that has been preserved together with all its features for 45 million years displays exactly the same characteristics as present-day specimens. If—as Darwinists maintain—evolution had taken place, then this insect should exhibit exceedingly primitive features, various half-developed organs in its structure, and also a large number of incompletely formed organs that, again according to evolutionists, supposed evolution should have either eliminated or else developed fully. Yet this scenario does not apply to any of the fossil record. Living things have existed fully formed and in a complex state, with all their present organs and characteristics, over millions of years. Pictured is a small but fairly long species of centipede. Today, these crustaceans live in the ground and under rocks and may sometimes have more than 30 pairs of legs. Centipedes have exceedingly complex features. 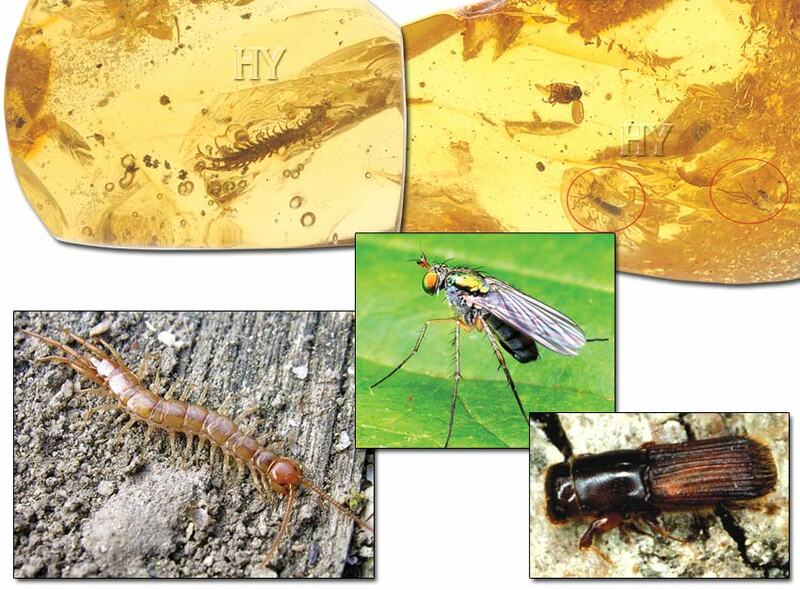 The occurrence of these animals inside fossilized amber proves that they have had the same complex structure and anatomy for millions of years. Darwin and those who came after him believed that the fossil record would eventually provide evidence for their theories. Yet the exact opposite transpired: The fossil record actually provides abundant evidence for Creation, and refutes evolution. Today's crane flies have characteristically long legs and bodies and large, well-veined wings. 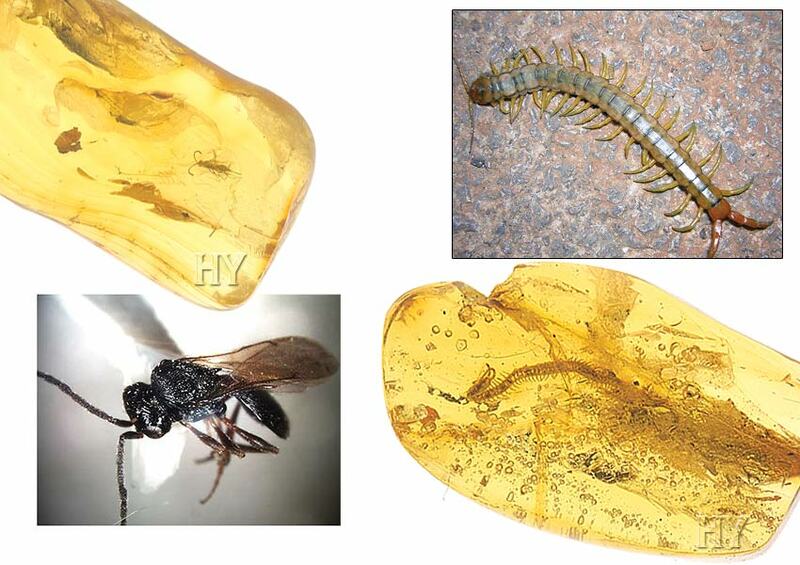 These same features can also be seen in this 45-million-year-old crane fly fossilized in amber. The fact that this insect has preserved its same anatomy over 45 million years, with no change whatsoever, is a clear indication that it never evolved—and that it was created in possession of the same superior features it has now since it first came into existence on Earth. Evolutionists make utterly groundless claims regarding the supposed evolution of insects, as they do with all other living things—and they themselves are well aware of this. 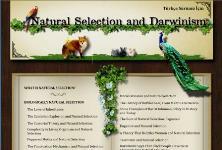 Darwin claimed that all living species attained their present complex structures by undergoing small, gradual changes. According to his imaginary claim, an extremely lengthy evolutionary process must have taken place, and primitive and half-developed transitional life forms must once have existed in the past. In addition, there should be a large number of fossils belonging to such creatures in the geologic strata of the Earth. However, the fossil record provides not a single example of any semi-developed or supposedly "primitive" life forms whose discovery Darwin predicted. As can clearly be seen in the fossil record, as well as in the 45-million-year-old deathwatch beetle pictured, the fact is that living fossils reveal the fact of Creation. The stick insects are known for their ponderously slow movements and superb camouflage. With their long bodies, antennae and colors, they do indeed resemble slender twigs. It can sometimes be difficult to tell a stick insect on a plant apart from the plant itself. Animals that use various forms of camouflage enjoy special protection with their bodily structures, shapes, colors and patterns, all created to match the environments they inhabit. As can be seen in this specimen, living things possess well-organized, complex structures that totally invalidate the theory of evolution's claims of "chance." Every living thing bears its own evidence that it was created. The ability to employ camouflage is just one of these pieces of evidence. It can sometimes be difficult to tell a stick insect on a plant apart from the plant itself.